How to Color Your Hair Like a Celebrity! Have you ever noticed how most celebrities tend to change their hair color depending on the event, season and weather? If not, then you’re either not paying attention, or you’re a guy! The good news is that you too can mimic the celebs if you know what you’re doing. Read on for expert tips! Whilst the celebrities can probably get away with going for striking new colors, a general rule for us “common folk” is to keep within two to three shades of our own hair color. This not only looks more natural but it can be easier to maintain as well. This rule applies to highlights too. Of course this begs the question; how do you find the specific hair color which suits you best? Well, there are a couple of methods. One way is to book an appointment at your local salon to have a color analysis. This obviously is recommended if you can afford the extra salon visit because you’ll get a truly personalized, expert opinion. Plus, due to problems with colors irritating or burning skin or your scalp, many salons will perform a skin test to determine sensitivity and ensure that you are unlikely to react to the hair treatment. If you don’t want to pay for a professional hair color analysis, you still will be in good shape if you follow a few basic steps. The first step is to determine your own hair color if you don’t already know this. A good tip to remember is that men can often be the best judge of hair color, because they can sometimes be more objective. Once you have worked out what your natural hair color is, try thinking of shades that are really rich in your mind, but that stick to your own color palette. For example, if your hair is a dark blonde color, but also contains some dark brown and red strands, colors that would work for you would be reds and browns. I would always recommend trying colors that are slightly darker than your normal shade, and always try colors that are redder than your normal shade (red tones are really popular at the moment). Sometimes just changing by a few shades or tones – as opposed to a complete change – is enough to dramatically liven up your style. Take time, browse pictures in magazines and be patient, to ensure that you choose the right hair color for you. Picking a new color for your hair should be fun – so ask your friends and enjoy the experience! First and foremost, before considering any new color, it’s important to ensure that your hair is in the best condition possible. Thus, use a deep conditioning treatment a few days before you apply the color (either do it yourself or go to the salon). This will help to ensure that the color has the best chance of retaining its vibrancy and remaining in good condition for as long as possible. In terms of the actual coloring process, you can either go to the salon or do it yourself. In my opinion, it’s worth the expense of going to the salon. As I previously mentioned, most salons will do a color analysis to ensure that the best possible color is chosen, and you can rest assured that the job will be professionally done by a true expert. But if you’re the adventurous type, there are plenty of do-it-yourself hair coloring kits on the market. If you want to dye it yourself, try some wash-in wash-out formulas before you commit to a permanent color. This way you can be sure of the color and whether it suits you (the usual recommendation is just to go one shade darker each time). Plus, this will give you some much needed practice in terms of actually applying the dye. And no matter what specific formula you get, always follow the instructions on the box precisely. Many people worry about their color fading. Whilst this is inevitable, there is something that you can do about it! If you wash your hair in cool rather than hot water, this can help maintain the color better and for longer. Also, wash your hair less frequently in general, and always use a shampoo that is specially formulated for colored hair. Baby shampoo can also be used as it is less harsh that regular shampoos. Additionally, avoid burning or drying out your hair. Hence, do not go out in the hot sun for long periods of time, and avoid scorching your locks with the hair straighter, curling iron or blow dryer. If you absolutely must use hair tools, try and keep them on a cooler setting. Experts and insiders reveal the tips and tricks for your lengthiest locks yet. 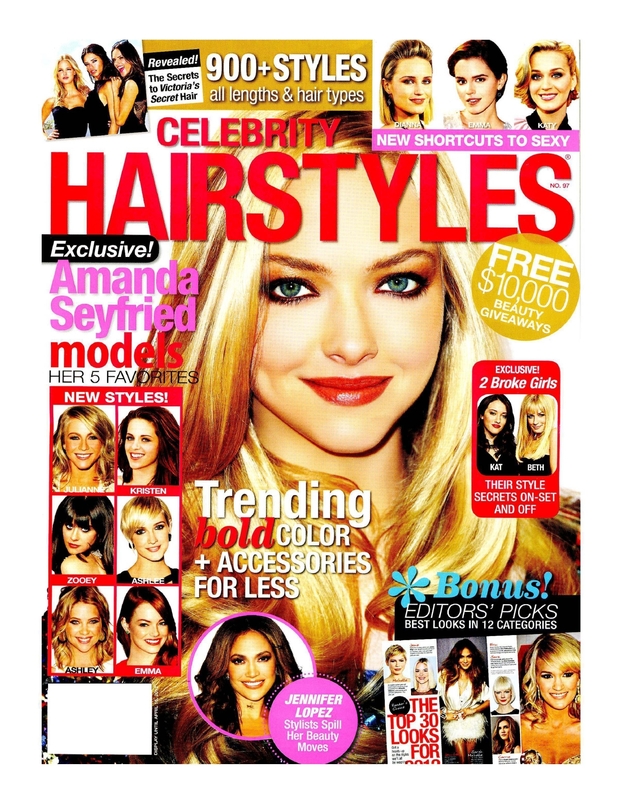 Also take a peek at our little black book of celebrity hairstylists. When the lights went up at Anna Sui’s fall show and the models made their way down the runway, every woman watching had the same thought: “I want that hair.” It was long, lustrous, and literally bouncing as they walked; hair god Garren had created the shampoo-commercial locks we all covet. But how to get such gorgeous hair? Surprisingly, no matter what type you were born with, the same rules apply: The less you do to your hair, the healthier it will be and the longer it can grow. First, give your torturous flatiron a rest. Of-the-moment long hair has “waves and/or volume,” says celebrity hairstylist Mark Townsend, who coifs Amy Adams and January Jones. Read on for more advice from the pros. DON’T IGNORE YOUR SCALP Turns out there’s truth behind the old adage of brushing your hair 100 strokes every night. Here’s why: When brush bristles come in contact with your scalp, they stimulate blood flow, which can jump-start your hair growth. The key is using natural bristles because they are gentler than damaging metal and synthetic versions and will prevent your hair from splitting and breaking off before you achieve your desired length. “It’s all about the bristles,” says Townsend, who favors Mason Pearson boar-bristle hairbrushes. New York-based fashion designers Lisa Marie Fernandez and Rachel Roy are both fans of another hair-growth ritual, scalp massages. “I pay someone to come to my house once a month and give me a 40-minute hot-oil scalp treatment,” says Roy. “The massage stimulates growth.” For an at-home treatment, try massaging essential oils into your scalp to boost circulation. We like Phyto Phytopolléine Universal Elixir ($32), with rosemary, eucalyptus, and lemon. INVEST IN SUPPLEMENTS There is no better way to strengthen weak strands than a daily supplement. “Biotin is amazing for the hair and nails,” says Townsend, who has seen major changes in the tresses of his supplement-taking clients. Nutritionist Kimberly Snyder, who works with stars like Drew Barrymore and Olivia Wilde, agrees. A daily liquid dose of a B-complex vitamin “helps strengthen the hair and nails,” she says. Try Garden of Life Vitamin Code Liquid Multivitamin ($46.95) with vitamin B complex, which is easily absorbed by the stomach and works more efficiently than taking a B6 or a B12 vitamin alone, she says. Another favorite hair booster of in-the-know celebrities, hairstylists, and models is a pill called Viviscal ($49.99 for 60 tablets), a natural blend of fish proteins, horsetail extract, and vitamin C that when taken twice daily for six months promises to deliver major growth and smoother, thicker strands. “I’m a firm believer in it,” says Townsend, who has recommended it to at least six A-listers with successful results. He adds, “If you take it, you’ll have a gorgeous head of hair.” Actress Liv Tyler told Bazaar she started taking it as well after hearing buzz from friends. HEALTHY DIET = HAIR GROWTH If you really want to see permanent, positive changes to your hair’s health, diet adjustments are crucial but can take one to two months to begin to have an effect. “Your hair comes from what you eat and drink,” explains Townsend, who uses his client Jessica Biel as an example. “She has gorgeous hair and is probably the healthiest person I’ve ever met, so I attribute it to her diet,” he says. Snyder recommends filling your plate with green vegetables like kale, Swiss chard, and spinach, which contain sebum-producing vitamins A and C; they act as natural hair conditioners and shine boosters. Chia or pumpkin seeds tossed on top of your salad add omega-3 fatty acids, zinc, and iron, all of which help maintain healthy hair. Actress and TV host Padma Lakshmi credits her long locks to a diet of lean proteins like eggs, chicken, fish, and veal. WASH LESS, CONDITION MORE Lathering up daily can dry out your hair by stripping away the naturally occurring oils that act as your scalp’s built-in conditioner and help fight split ends — and minimal split ends means less you need to chop. Experts agree: Scale back washing sessions to once or twice a week (try Fekkai Au Naturel Dry Shampoo, $23, as a refresher), and when you do shampoo, use a gentle formula like Sachajuan Scalp Shampoo ($25) or L’Oréal Paris EverPure Sulfate-Free Moisture Shampoo ($6.99). Focus your attention on hydration. “Conditioning treatments are crucial,” says Serge Normant, Julia Roberts’s longtime stylist, who says combing through your hair while the conditioner is still in it helps to keep knots from forming and to avoid the breakage that occurs when you try to brush through post-shower tangles. BOOST SHINE For instant luminosity, try Liv Tyler’s trick: “Before I get out of the shower, I do a cold-water splash, which makes my hair extra shiny,” she says. Townsend does the same for his clients. “It shocks the hair and seals the cuticle,” he says. “Shiny hair always looks healthier,” says Normant, but beware of in-salon glossing treatments as a solution. While they can help smooth down the cuticle, they won’t treat your hair and can dry out your scalp. Best bet: Try one before a big event to increase shine, but use Dove Nourishing Oil Care Leave-In Smoothing Cream ($4.74) for daily glossiness. As we all know, summer is all about baring skin and showing off your tan at the beach. But of course, in order to look good in doing that, you need to take some time to prepare yourself and reverse the signs of neglect over the past seasons. Let me share to you some tips to help you look young and fresh this summer. Here are some of them. 1. Exfoliate, exfoliate, exfoliate. It is very important to exfoliate your skin. Our bodies constantly shed skin cells throughout the day, every day. If you don’t get rid of these dead cells, they will just sit on your skin and make it look dull and dry. Ladies, no matter how much lotion you use, you will never achieve that perfect glowing skin if you don’t exfoliate. Be careful not to overdo it though. Too much exfoliation can lead to more serious problems such as skin damage so just limit it to one to two times a week. 2. Be flawless and hair free. During winter, there’s really no point in keeping your legs hair free and flawless, however, summer is a completely different story. You may not look you best when you put on your old bikini, but trust me, you’ll feel more confident and a whole lot better if you get rid of all your unwanted hair from your legs, to your underarms to your bikini area. 3. Protect your skin from the harmful rays of the summer sun. Applying sunscreen that provides protection for both UVA and UVB to all areas of your skin that will be exposed to the sun is definitely a must. If you’re going to the beach or swimming in the pool, use a water resistant sunscreen. It is very important to reapply every two hours to get the maximum protection. It is also very important to use a new bottle of sunscreen as sunscreens are not meant to last forever. If you think your old bottle has been lying around in your dresser for several months, throw it and get a new one. 4. Pamper yourself with a relaxing facial skin treatment. Summer can make your skin dry, itchy and darker than usual. It is very important to pamper your skin with treatments that not only soothes and calms you but also restores your skin’s healthy state. 5. Get a new hair color. Summer is a great time to try something new and exciting, like changing your hair color. You can go for a subtle shade, a trendy shade, or if you’re brave and confident enough, a bold shade. Summer is here and it’s the best time of the year to go out and have fun under the sun! But before you step out and roam around, it is nice that you look and feel good about yourself and that you are ready to mingle with friends. Auburn hair color – it is often mistaken with the red as both have common characteristics. Many describes it as a type of hair color that is somewhere between red and brown (but more on red side probably). This type of hair color design is gaining more popularity because of its natural look. Wondering how this type hair looks like? – Checkout Sarah Michelle Gellar’s. Dark ash blonde – it is brown and yellow hues combined and is said to be a perfect option for people who cannot pull off ash blonde. Some would describe it as a light brown color with hints of ash blonde. Although this type is a good option for summer, it is not suitable fit for everyone. Dark chocolate brown – is another hair color design option that is suitable for summer. It is fits for most color tones and appears the shiniest of all hair colors. Want to know more about this color type? Well, ask the Glee songstress Lea Michelle – one of the most popular dark brunettes in showbiz. Honey blonde – another good option for summer hairstyle would be the honey blonde. This is considered the most popular as you cannot only use it during summer – you can have it the whole year round! Aside from that, this type will make your hair appear like that of natural blonde. Experts suggest that women who dye their hair with this color need to have light or mousy hair. Still struggling to figure out how does it look like? Think of JLo’s. Shades of Ombre – this can also be a good option for you this summer. Experts recommend this for brunettes. To get more ideas about how does it look like, check out these celebs: Drew Barrymore; Lily Aldridge; Nicole Richie. Useful tip: It is always beneficial to seek an advice from a hair expert before you apply any color on your hair, most especially if it is your first time. Don’t let your summer time be spoiled by a hair ‘tragedy’. Make it safe! Weddings take months to prepare. Even if you have a year of planning to spare, you might still be pressed for time as the big day draws near especially if you are taking care of the tiniest details yourself. The good news is that once you have made a decision on the major details, the other smaller aspects of planning a wedding should easily fall into place. – The time of day and season of the year that the wedding will be held. – The theme of the wedding. – The venue for the ceremony and reception. Let’s say that you are having a summer wedding and the reception will be held outdoors, in the afternoon. When planning on the bridal hairstyle, make sure to take the weather into consideration. Since the ceremony will be held outdoors, the bride should have a hairstyle which would not be easily swept by the wind, or look limp if it’s a bit sunny. The bridal hairstyle should not need constant re-fixing, so make sure that it can last throughout the day and well into the after-ceremony party when the bride and groom are bound to dance the night away. Aside from the weather and the time of day that the ceremony will be held, another factor that you may want to consider when making wedding plans is the current bridal trends for the year. Now that 2011 is almost over, what are the hottest trends for bridal accessories, gowns and hairstyles that you may want to follow? Read on to find out. First, what are the emerging trends this coming 2012 for bridal accessories? If you’ve had a chance to see runway shows for the hottest bridal trends for the next fashion season, the focus is on gold accessories. This is especially true if you are planning a winter wedding. From the bride’s shoes to hair accessories and jewelry, anything that’s made from gold can be considered trendy. The good thing about following this particular trend is that gold never goes out of fashion – just make sure not to overdo it. Simply choose one or two gold accents to complete your look as a bride, and you should be good to go. For bridal and bridesmaid’s gowns, the trend veers towards big, layered skirts which are made from sheer materials. Some of the most popular fabrics used by designers include lace, crepe, batiste, tulle, chiffon and organza. Instead of having a dress which is only made from lace, for example, the trend is more towards using a combination of all these materials. Finally, when it comes to hairstyles for the bride, the trend is to go simple and loose. Ditch those updos which take stylists hours to create and simply have your hair as a bride styled with natural, loose curls or waves. As an accent, you can go for a sparkling gold brooch, a large gardenia or another exotic flower, as well as birdcage veils which can become the focal point of your bridal outfit. A woman’s hairstyle can speak volumes about her personality. Long hairstyles are a great way for women to express their individuality, while feeling attractive and trendy. Celebrities with gorgeous long locks are the envy of many women. These hot hairstyles are not exclusive to celebrities and can be worn by everyday women with the appropriate cut and some easy styling tips. Many women wish to achieve super straight hair. For some women, getting this look is as easy as wash, dry, and go. For others, who were not born with poker-straight hair, additional work is needed to achieve this popular look. A flat iron can be used to straighten locks with the use of heat. It is advisable to first spritz the hair with a protective spray in order to reduce damage the heat can cause. If a flat iron is not available, an anti-frizz serum or laminating spray can be used to fend off flyaways and give unruly hair a sleeker look. Complimenting a super straight look, blunt haircuts are the latest style. The blunt haircut gives long hair a very clean cut, sharp look. Among the latest in trends is cutting edgy bangs to complete the straight hair look. Bangs can be cut short or long, thick or thin. Women with a smaller forehead may prefer fuller, short bangs. Long, straight bangs that meet the eyebrows can transform an outdated look into the newest fad. 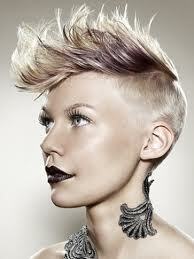 Geometric cuts are becoming more popular and offer straight styles an off kilter look. Geometric cuts can be as simple as cutting one side of the hair a bit shorter than the other. These styles are an opportunity for stylists to create a hairstyle that uniquely frames a person’s individual facial features. If a geometric cut seems a bit risky, razored angles around the face can offer a trendy addition to a long, straight style. Wavy and tousled styles are as popular as straight styles. Sun, sand, and saltwater may not be the ideal hair treatment, yet women seem to walk the beaches with perfect, tousled locks. Beach hair, which has become popular throughout the year, can be easily achieved at home. Texturizer sprays are a great way to separate strands of hair and create beachy waves. After applying the texturizer to the hair, it is important to scrunch the hair in order to achieve the desired look. While some women are rushing out to buy a flat iron to create straight locks, others are buying the same irons to create long, loose curls. Women have been ditching their barrel irons for straighteners that create luxurious curls. After some practice, creating curls with a flat iron is very fast and easy. Begin by dividing the hair into two sections. Starting with the back of the hair, clamp a one inch section of hair a few inches from the scalp. Next, turn the flat iron a complete 360 degrees. Lastly, loosen your grip on the iron and pull the iron straight through to the ends. Creating perfect curls is not necessary since the messy, undone look is among the latest trends.